This part of your policy generally pays to repair or rebuild your home if it is damaged or destroyed by fire, hurricane, hail, lightning or other disaster listed in your policy. It generally does not pay for damage caused by a flood, earthquake or just wear and tear. Think of a homeowner/condo/townhouse/renters policy as a "disaster" policy and not a "maintenance" policy. When purchasing coverage for the structure of your home, make sure to buy enough to rebuild your home. 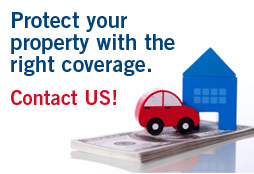 Also, review this coverage on an annual basis to make sure you have sufficient coverage. Your furniture, clothes and other personal belongings are usually covered if they are stolen or destroyed by fire, hurricane or other insured disaster. Most companies provide coverage between 50% to 70% (this is just an average, every policy is different) of the amount of insurance you have on the structure of your home. The best way to determine if this is sufficient is to conduct a home inventory to determine the best level needed. If you have questions about what is covered by a specific policy, contact us and talk to an agent. This part of your policy may also include off-premises coverage which means that your belongings are covered anywhere in the world. Liability coverage is included and protects you against lawsuits for bodily injury or property damage that you or family members cause to someone else. It also pays for damage or injury caused by your pets. The liability portion of your policy also pays for both the cost of defending you in court and any court awards—up to the limit of your policy. Liability limits generally start at about $100,000, however for just a few dollars a year and recommended, you can increase to $500,000 in coverage. Some people feel more comfortable with more coverage. You can also purchase a Personal Umbrella Policy which provides broader coverage, including claims against you for libel and slander, as well as higher liability limits. Your policy also provides no-fault medical coverage. If a friend or neighbor breaks an ankle playing basketball in your back yard, he or she can simply submit medical bills to your insurance company. Expenses are paid without a liability claim being filed against you. You can generally get $1,000 to $5,000 worth of this medical coverage. If your home is damaged because of a fire, storm or other insured disaster and you can't live in it, this coverage pays the costs of living someplace else while your home is repaired. While your home is being rebuilt, hotel bills, restaurant meals and other living expenses are covered. There are limits of coverage, so discuss this with the agent for proper coverage needs. Footnote: This is a brief overview of the coverage that can be included in a Homeowner's, Condo, Townhouse, Mobilehome or Renters Insurance policy. Discuss your particular needs with one of our agents.